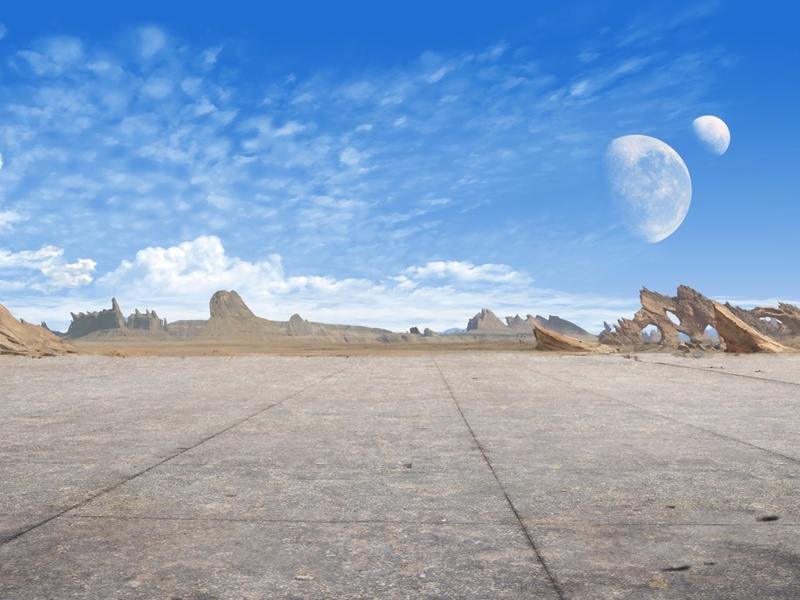 The Radar is one of the many Buildings in Evolution: Battle for Utopia game. The Radar helps your Turrets to detect other players’ attempts to attack your base in PvP battles. 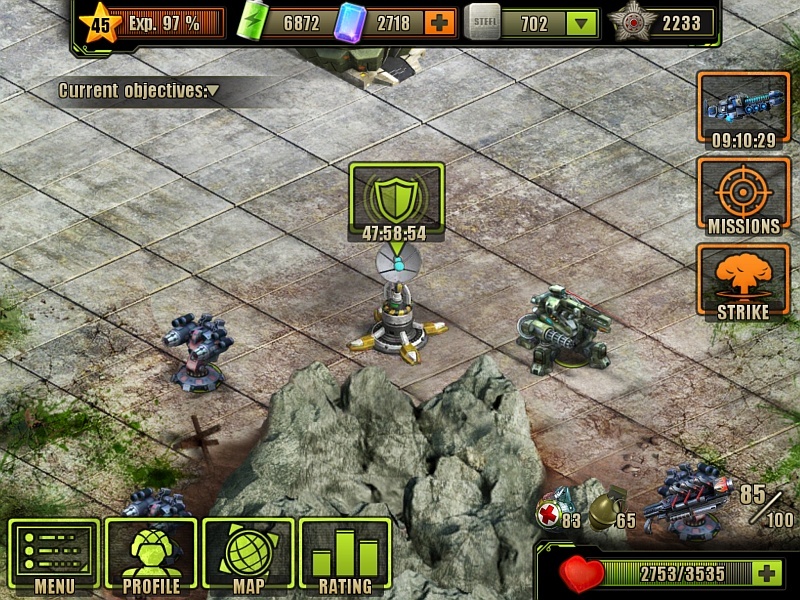 If the detection is successful, the attacking player will have to fight against one of your turrets as well, which will significantly increase your chance to defend your base successfully. 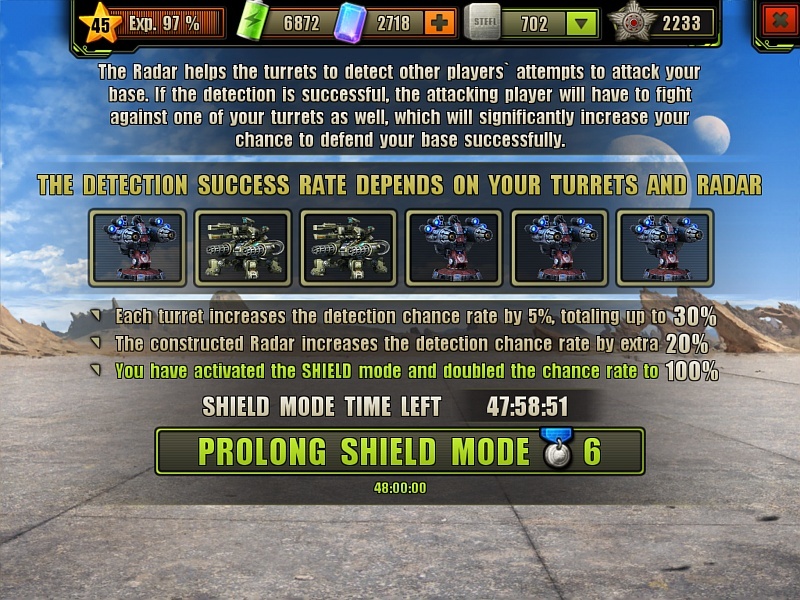 Enter the Radar building to see all your turrets and the total detection chance rate. Press Activate Shield button to raise your base defense to maximum. The Shield ability is last for 48 hours and costs 6 to activate. On your base screen you can see Radar’s state – ON/OFF – and remaining time until deactivation. Mode ON/OFF means just SHIELD ability activation state. 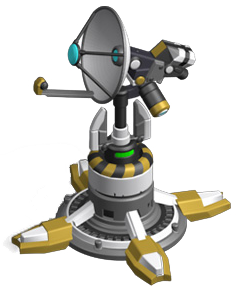 Build the Radar as early as possible for successful resistance against other player’s attacks. It is desirable to purchase two extra turrets as early as you can. Radar and 6 turrets will ensure 20% + 6*5% = 50%. And with activated Shield ability your base will be safely resisted with turret against all attacks on 100%. You also can prolong the shield mode for another 48 hours by spending 6 more. There is no upper limit for shield mode time. You can’t manually turn off the Radar once it was activated. If we are out of reach of any wireless network (meaning we are playing offline), can we still be attacked by other players? If so, what is the detection chance percentage if we have Radar ON? And if it’s OFF? How it works if we’re OFFLINE??? If you are offline, you still can be attacked by other players. Your Radar status is under gameserver control. Influence of Radar is illustrated on the screenshot above. Not at all… When you meet that criteria, your base will always be defended by turrets + you + your partners. Without radar or without that criteria is met, your base will only be defended by you + your partners which can make some difference (some says it doesn’t, but…)! To reduce cost on research of the Radar, you need to use 8 G1 Incendiary Grenades. To get your hands on those grenades, you need to kill / rob the Merchant that is wrong in itself. Conclusion: I’m beginning to think it doesn’t worth to reduce 4 disks out of 20 disks that cost the Research for building the Radar simply because it is too much work to get it discounted. The same treatment might happen to my Anomaly Lv.5 Research if by that time i still haven’t unlocked Psi Powers.